Party on! 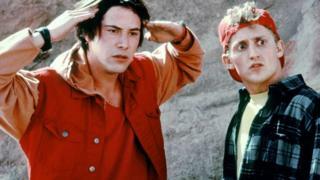 It's official: Bill and Ted's excellent adventure is set to continue - 30 years after their first time-travel escapade. The new instalment, Face The Music, announced at the Cannes Film Festival this week, will see Keanu Reeves and Alex Winter back as Theodore 'Ted' Logan and Bill S Preston Esq. But this time, they'll be navigating middle-age and family responsibilities. The writers of the first two films, Chris Matheson and Ed Solomon, are behind the script, while Dean Parisot is confirmed to direct. But after three decades, why are two dudes with completely normal names still causing such excitement? Who are Bill and Ted? The goofy pair of metalheads first hit screens in 1989, after years of refinement in the stand-up comedy routines of their creators, Matheson and Solomon. The characters' slacker vibe took the nerd stereotype that had popularised 1980s teen movies and turned it on its head. Californian high-school kids Bill and Ted represented the everyday teen - blundering through life with happy-go-lucky passion, wide-eyed naivety, and a host of catchphrases delivered in sincere (yet satirical) surfer drawl. Bill and Ted were lost in their own world of original cool, admirably struggling in their ambition to write the best song ever with their rock group the Wyld Stallyns. Enthusiastic phrases such as "bodacious" (extremely good or bad) and "excellent!" came to dominate the lexicon of a generation. And what about their adventures? There have been two feature-length films in the franchise, followed by a spin-off cartoon series and even a video game. The first film introduces the pair as they are about to fail their history class, which would force Ted to go to military school - scuppering the band's ambitions. Using Rufus's time machine, cunningly disguised as a phone box (who would have thought it? ), the trio travel to various points in history. They return with important historical figures - including Napoleon Bonaparte and Genghis Khan - to help them complete their final history presentation. Set a couple of years on from the first film, Bill and Ted are engaged to Elizabeth and Joanna, the "totally historical babes" (otherwise known as 15th Century princesses) from their first adventure. But trouble emerges when De Nomolos, the nemesis of their future utopia, sends evil robot duplicates of the pair to kill and replace them. The machines succeed, but the human Bill and Ted challenge the Grim Reaper to a series of games in a bid to return to the land of the living. Death eventually loses, bringing the pair back to the mortal world in time for the Battle of the Bands. They go on to win and, it seems, bring harmony to earth. "They've written thousands of tunes, but they have yet to write a good one, much less the greatest song ever written," reads the synopsis. As the world faces destruction, Bill and Ted will once again turn to time-travel "with the help of their daughters, a new crop of historical figures and some sympathetic music legends" to bring about world peace. A bodacious comeback or totally bogus? The film's official announcement follows years of script rumours, with Reeves and Winters hinting in various interviews that they would be interested in making a return. Speaking at Cannes, Reeves and Winter said they "couldn't be more excited to get the whole band back together again. "Chris and Ed wrote an amazing script, and with Dean at the helm, we've got a dream team!," they said. It is not yet known who will play the duo's radical offspring, but the broader success of the franchise depends on the humour crossing the generational divide - as well as the potential of the daughters to take on the mantle in any further films. After all, much has changed since 1991, with digital beats rather than guitar riffs dominating the charts. As writer and publisher Justin Quirk tells the BBC, Bill and Ted's original adventures stood "just before before a very clear dividing line in drawn in American pop culture". The second film hit screens months before the release of Nirvana's Nevermind and Guns N' Roses Use Your Illusion, "respectively signalling the emergence of grunge and the collapse of metal under its own weight", he adds. The same is true from a technological perspective. according to Oliver Smith, senior tech reporter at Forbes. He says the duo represent a generation unaware that the internet "would soon play a defining role in everyone's life". "In the decades since, we've seen smartphones in the pockets of millions - alongside Instagram, Facebook and Tinder - something that would have blown Bill and Ted's minds," he tells the BBC. The franchise feels like it belongs to the age before that says Quirk, and part of what makes it so charming is "the innocent, uncomplicated quality that it has." Perhaps in these times of global instability these qualities will provide comfort, with parents able to bond with their sons and daughters over "the love of some old favourites," he adds. But, however the comeback turns out, remember, most importantly of all - be excellent to each other.